Create VR Apps Online - No installation required! Want to create your own Virtual Reality App without expensive App developers or bulky software packages? 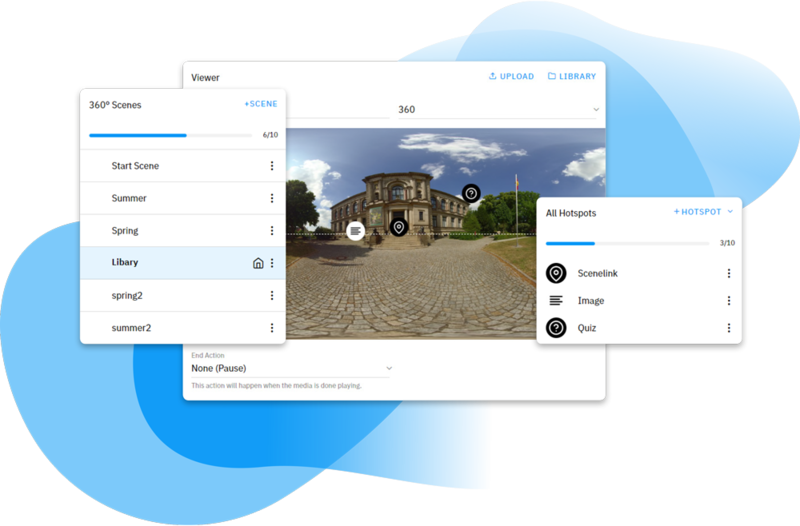 With our cloud software you can create, configure and export your VR applications. At the push of a button you can make your software available as a smartphone App, for use in web browsers or for VR headsets – whether on the road, in the office or at home! Our intuitive user interface makes your life easier! We want to make it as easy as possible for you to work with our web interface. Our designers and developers keep one thing in mind. Simplicity. This means that you will find everything you need right at your fingertips – and only be offered advanced additional settings when you really need them. The editing view within the Editor has been divided into clear blocks. Scene List By a scene we mean a virtual realm/sphere in which the later end user will find themselves. We then project your selected 360° medium onto this sphere. In the Scene List everything revolves around your virtual scenes in which the user will later find themselves. With a simple click you can switch between different scenes, edit them, delete them and of course add new ones. Hotspots Hotspots are interactive elements that transform your virtual App into a truly unique experience. In this block you will find a list of all your hotspots. Via a menu you can easily select a new hotspot. In our Hotspot Feature you will find a more detailed explanation of how these interactive elements work. Viewer The Viewer is your work bench. Here you can view whole scenes at a glance. Your inserted background medium is displayed similar to a panorama image. On the picture you can simply move your inserted hotspots to the appropriate place in which they should later appear. The simple design of our complex application increases your productivity! Our team of designers has put a lot of work into making the application as intuitive and as simple as possible for you. It was important to us that the software was quick and easy to use, but that the option for detailed settings remained available throughout. This makes our software fun for everyone. From beginners to professionals. A prime example of this is the positioning of hotspots in a scene. For quick placement you can use the Drag’n’Drop function. However, if you need to be precise, you can adjust the coordinates for latitude, longitude and distance within the sphere to within a few pixels. Does your software run in any browser? We always recommend using one of the two browsers in order to be able to use our software to its full extent.